The material in this section is designed for easy access, downloading and use for distribution to others. There is a summary of countermeasure research, motorcycle helmet information including the common myths, information about the impact of helmet laws or the repeal of such laws and a section regarding full protective gear. In addition to this section there is also great material for distribution or use in presentations posted in the drop-down menu under GEAR, and IDEAS & OPINIONS and PLANS & PROPOSALS in the drop-down menu under INFORMATION. Contact us at smarterusa@gmail.com if you don’t find what you are searching for. Countermeasures that Work – Special Edition of Riding Smart – What the Research Tells Us: This Jan./Feb. 2018 Special Edition of Riding Smart summarizes the major research and literature reviews which address countermeasures in motorcyclist safety. Countermeasures are the things we do to try to reach our goals. Interventions, efforts and program components are other descriptive terms describing what we do. A main mission of SMARTER is to gather and make motorcyclist safety research easily accessible. This special issue is designed to provide a quick reference summary of the research regarding countermeasures that work (or have no evidence of working). Neck Injury, Neck Pain & Preventative Measures: This is an October/September 2018 special edition of Riding Smart, the member newsletter of SMARTER. The research regarding helmets and neck injury is reviewed, the issue of neck pain and wearing a helmet is addressed and injury and pain preventative measures are discussed. Riding SMART! (Sept/Oct 2014): A downloadable special edition of SMARTER’s newsletter is a quick reference that (1) summarizes quality research and/or literature reviews related to helmet use and helmet-use laws, (2) provides a brief history of helmet use and helmet-use laws, and (3) reviews the components and goals of a comprehensive motorcyclist-safety program. Research Reference List: Motorcycle Helmets and Helmet Laws: Studies show helmets save lives and reduce injuries and that all-rider helmet laws are a scientifically proven lifesaving intervention. SMARTER has compiled a Research Reference List regarding motorcycle and motorcycle helmet law effectiveness including economic impacts. Debunking Common Claims Against Motorcycle Helmets and All-Rider Helmet Laws: The truth about what you may have heard: Anti-helmet law advocated who want to repeal all rider helmet laws so that they can have the freedom to feel the wind in their hair have been known to “bend the truth” about helmets. In order to convince decision makers to repeal a lifesaving, injury reducing and cost preventing law, they haven’t been entirely truthful about the facts. Here are the FACTS. What You Should Know About Motorcycle Helmets: The Motorcycle Safety Foundation, as part of its Cycle Safety Information series, produced this four-page document explaining the basic construction of a helmet, how helmets work, and how to choose one that fits. Bogus Helmets: What You Know Could Save Your Life! – the Washington State Patrol, in cooperation with the Washington Traffic Safety Commission, produced this four-page helmet-shopping guide to explain the differences between real helmets that have been manufactured to meet DOT standards and fake, novelty-style helmets with thin shells. Why Should You Wear a Full-face Helmet? : This “wear your helmet” poster prepared by Jeff Dean shows the helmet worn by Dave Swisher, a 1.1-million-mile BMW rider, after he suffered a crash, along with schematic diagrams of the impact areas on crash-involved motorcycle helmets. Motorcycle Safety: How to Save Lives and Save Money: The Centers for Disease Control and Prevention produced this 26-page guide to inform readers about the public health significance of motorcycle crashes, the best way protect riders (showing the anatomy of a helmet and what helmets do to prevent injuries), how states compare with one another in terms of motorcycle-related deaths and economic costs, and what can be done to increase motorcyclist safety. 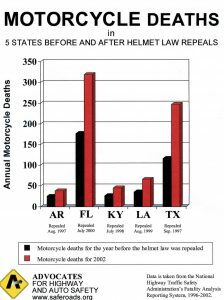 Top Reasons Why Every State Should Pass an All-Rider Motorcycle Helmet Law: This one-page document by Advocates for Highway and Auto Safety succinctly delineates seven reasons in support of mandatory helmet laws. All-Rider Motorcycle Helmet Laws Save Lives and Tax Dollars: A rider’s personal choice stops being personal when it ends up costing us all. This one-page document by Advocates for Highway and Auto Safety reveals why repealing all-rider helmet laws is bad fiscal policy. Universal Helmet Laws Reduce Injuries and Save Lives: This 14-page document resulted from a UCLA School of Public Health, Center for Injury Prevention, study that showed that a universal motorcycle helmet law is an effective and efficient traffic safety law that benefits society and individuals. Motorcycle Helmets and Helmet Use Laws: Research Facts Every Rider and Legislator Needs to Know. This six-page Q&A document by the Insurance Institute for Highway Safety addresses 12 common concerns about helmet use and helmet laws and provides 30 reference citations. 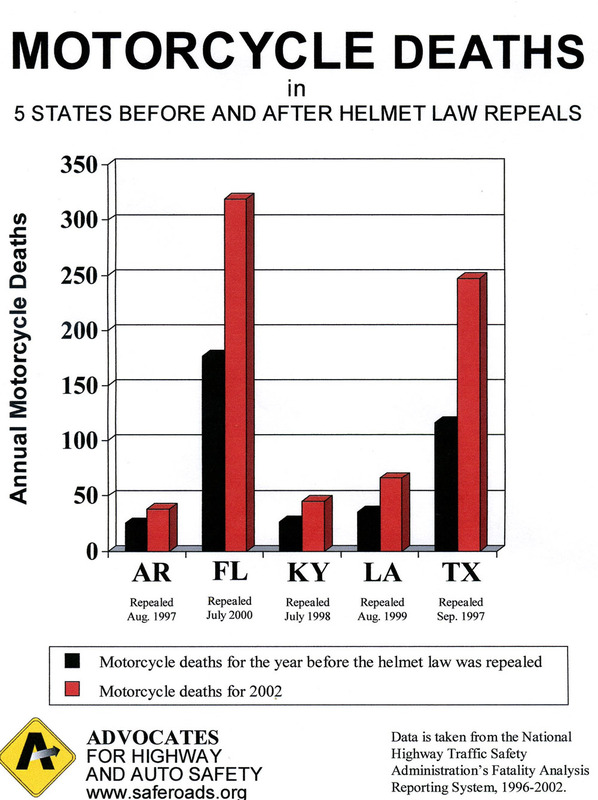 Motorcycle Deaths in Five States Before and After Helmet Law Repeals: This chart by Advocates for Highway and Auto Safety is a graphic representation of the toll taken in lives lost after helmet law repeal in Arkansas, Florida, Kentucky, Louisiana, and Texas. 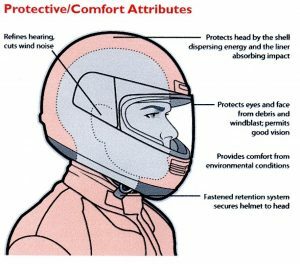 Personal Protective Gear for the Motorcyclist: The Motorcycle Safety Foundation, as part of its Cycle Safety Information series, produced this four-page document describing all aspects of head-to-toe riding gear and protective apparel in varying weather conditions. Epic Journey: My Struggle to Ride by John Stockman. This story is not about an epic ride, rather it is the story of the immeasurable challenges John Stockman faced in order to ride. It is also the story of the sources of his strength, his realizations about the public perception of motorcycling and his resulting dedication to make a difference. For Car Drivers: A Program of the Motorcycle Safety Foundation. Link to a website with information about learning how to safely interact with motorcyclists from the people who know the challenges of motorcycling the best – the Motorcycle Safety Foundation. For Car Drivers – Commitment-to-Safety Contract (MSF) A pledge for both new and experienced drivers to drive safely and to minimize risks and to lead by example, because family and friends are out there on the roadways – as drivers, motorcyclists, bicyclists, or pedestrians. From ForCarDrivers.com, a program of the Motorcycle Safety Foundation. Ten Things All Car and Truck Drivers Should Know about Motorcycles – MSF This information is from ForCarDrivers a Program of the Motorcycle Safety Foundation. We formatted it so drivers and driver educators could have a easily downloadable document. How to Drive Safely Around Motorcycles by esurance Five general rules to bear in mind when you share the road with motorcycles developed by esurance. We formatted their tips to provide drivers and driver educators with an easily downloadable document. Killer Pillars An article describing an investigative report into a car design has reduced driver vision in its quest for five-star occupant safety ratings – creating a lethal danger to motorcyclists. A Second Look created by the Washington Motorcycle Safety Program, follows a teen driver as a motorcyclist helps the driver learn about safer choices while sharing the road with motorcyclists. How Close Does a Motorcyclists Have to Be? A U.S. version of a popular U.K. safety video. Minnesota Department of Public Safety motorcyclist awareness public service announcement encouraging motorists to “look twice” for riders. Invisibility Training for Motorcyclist. This is an excellent video by FortNine which describes the visual and perception phenomena that result in motorcyclist not being seen by auto drivers and suggests five (5) actions riders can take to make themselves more likely to be seen. Important for drivers to understand why they sometimes look but fail to see oncoming motorcyclists. Thank you drivers, we appreciate you! 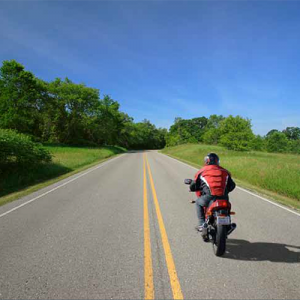 Motorcycle safety requires not only riders but drivers to take extra precautions on the road. Developed by the Washington State Motorcyclist Safety Program.